Today (28th March) marked the end of the counting season it also happened to be our 170th count since we started our quest. 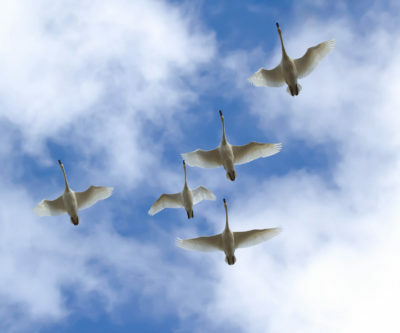 You will notice the theme of today’s count is all about the swans because that is why we started this back on March 22nd 2009. 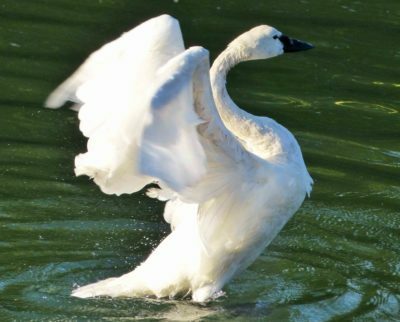 Many counters have come and gone and there is just a few of us who it seems are gluttons for punishment and have kept this swan count going. Many have driven us around some more than others and i thank them for keeping us safe. We have been blessed with some wonderful sights over the years, which if we had not been out there counting we would have missed all that this wonderful world has to offer. I for one have enjoyed my fellow counters company and the laughs that we have shared. I hope through my weekly reports I have given some insights into what we do and I hope that I have spread a little joy and laughter into your life. 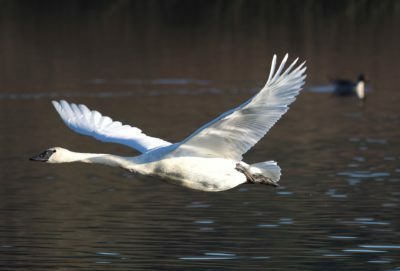 Now for the update on our swans and how they have fared over the years. The first year we had highs of 813 adults and 174 immature birds and over the seasons this has gone up and down with what appears to be a real downturn over the past 3 years. Our highs this year were 674 adults and 94 immature, so you can see that the numbers have gone down, what is most disconcerting is the drop in young birds and this trend has continued over the last few seasons. If you look at our highest counts in February 2011, where we had 924 adults and 224 immature, we have had some drastic drops in numbers since then. A lot of the birds have now started to move further south with many spending time in the Saanich area where once they were scarce. For the last 3 years our numbers have steadied with no major fluctuations and we can only hope that this continues although i would like to see more young birds staying in our area through the winters. At the end of this season we have failed to get into triple figures for immature birds this I worry about. 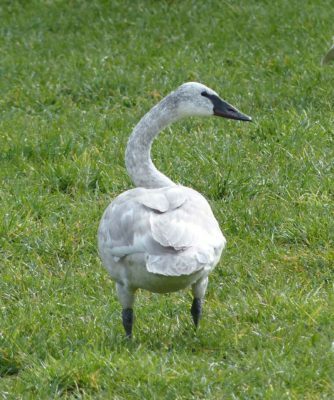 Now for the update on our geese and how they have fared over the years. 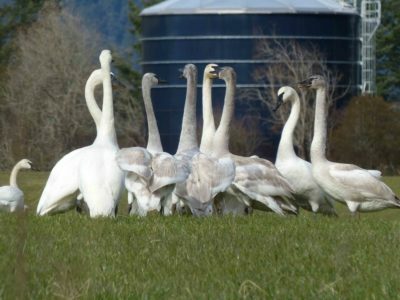 The first year we had a high of 1192 and a last week count of 258 and just like the swans this has gone up and down over the years This years high was 1607 and the last week count was 127. What i take from this is that near to breeding season the birds do what most birds do and migrate north. So the next time you read all that nonsense that is printed in our local rags about the goose population growing and the need for more hunting to bring down the numbers and whatever, they are talking out the tops of their heads. 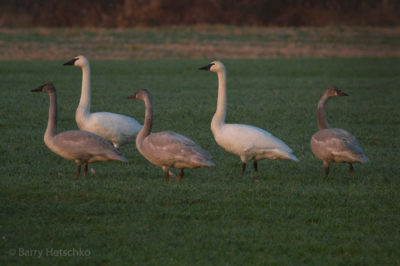 Most of the geese like the swans only spend the winter here and the impact on the environment is negligible. 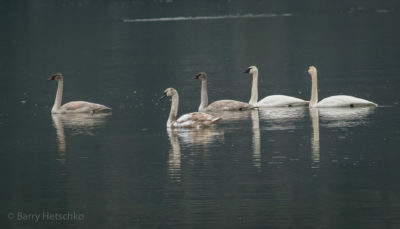 For the past few years more and more Trumpeter Swans are roosting in Cowichan Bay which is good for the swans maybe, there are many problems with the main one being lead shot which is laying in the mud of the bay from years of hunting, also industry is becoming more visible. 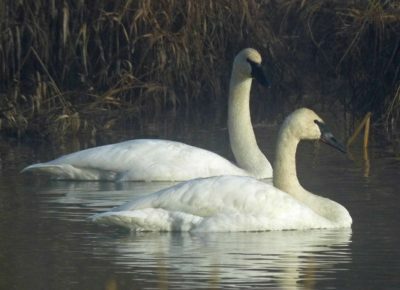 This is a very important estuary that needs our protection if the swans have decided to call this theirs for the future. Somenos Lake is one of the main roosting spots and continues to welcome birds most nights. Quamichan Lake is a mystery as not many Trumpeters use this lake for roosting even though it is very large, why this is i don’t have the answer, only that the lake must be missing something. Birds also roost up at Quist’s Farm when the water levels are reasonably high. 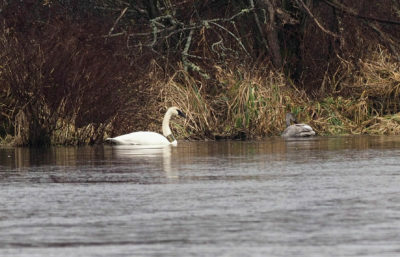 We have not seen much mortality of swans just a few deaths here and there mostly it appears from hydro strikes and we must do more to encourage hydro to put up deflectors on their wires in the regularly used areas. As for disturbance this happens every year and I don’t blame the farmers for trying to protect their crops but chasing birds is against the law and should be stopped. 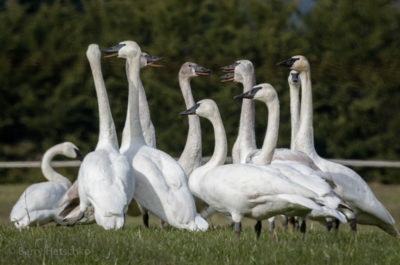 We need our government to come through with some compensation money for the hardest hit farms and for land that is owned by government and so called nature friendly groups to start getting their tenant farmers to plant crops for the swans, thus saving the impact on private lands. 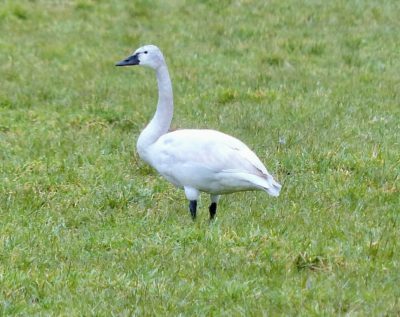 A prime example of what happened this year was in Cowichan Bay where we failed to find hardly any birds using the Nature Trust land because of the farming practices which were allowed to take place. Why on earth did Nature Trust buy the land if their not going help the birds? They also allow hunting on their lands on Vancouver Island, to me this is not very nature friendly and yet they are always asking naturalists to donate money to their cause? It is time for us all to pull together as nature in all forms is slowly diminishing and if we are to save something for those that follow we must act with urgency. Lastly i would like to thank all my friends that have come along over the years, it has been a real pleasure riding along with you and the laughs we have enjoyed and the wonderful sights and sounds we have all had. 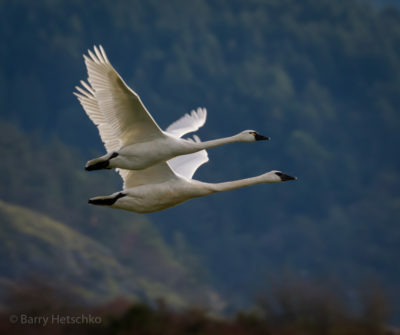 Enjoy these last count pictures, lot’s of them, they being all swan types and credit for these should go to, Barry Hetschko, Derrick Marven, Zan Stenhouse and Kurlene Wenberg, these friends have treated you to some wonderful shots of our weekly exploits. For Dorothy Marshall for keeping our numbers during our counts and to Eric, Paul and Elizabeth for making sure that the reports were sent out to you all.